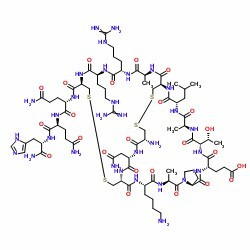 I’ve been working lately with the cysteine rich peptide apamin, an 18 amino acid peptide found in bee venom whose structure is controlled by two disulfide bonds, Figure 1. My goal was to not only synthesize the linear peptide, but also form both disulfide bonds on resin with regioselective control. In my planning, I first had to decide which cysteine variants to use. For this peptide I decided on pairing Fmoc-Cys(Mmt)-OH and Fmoc-Cys(Acm)-OH residues. Figure 1: Branches™ representation of apamin for an automated synthesis and on-resin cysteine oxidation. I have already optimized removing an Mmt protecting group for some work I did with oxytocin, making this an ideal choice for one disulfide bond. Acm protected cysteine is also commonly used for on-resin disulfide bond formation, so this was an easy second choice. Conveniently, the Acm protecting group can be removed and disulfide bond formed in a single reaction step. There are several strategies that can be used both in solution as well as on-resin to remove Acm protecting groups. I decided to use iodine-mediated Acm removal and concommitant cysteine oxidation to simplify the automation process. I synthesized apamin and formed the first disulfide bond – in this case between Cys 1 and 11 – using the Branches™ software feature on my Biotage® Initiator+ Alstra™ on 0.5 mmol scale in order to efficiently determine an automated Acm removal protocol, Figure 2. 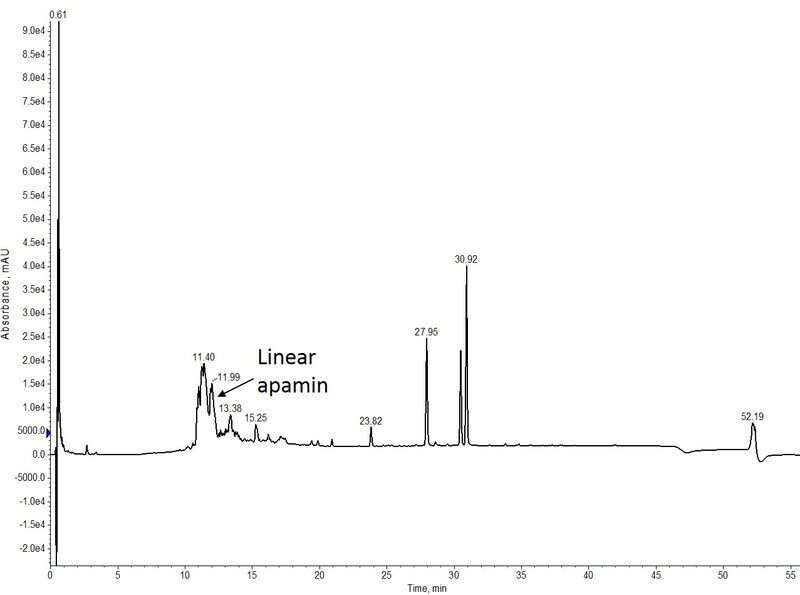 Figure 2: Crude analytical HPLC analysis of linear apamin. The desired product is in the minority, but still a significant component of the crude mixture. While the linear synthesis isn’t as clean as I’ve seen in previous attempts, the desired peptide product is still relatively abundant, so I decided to move forward with the on-resin Acm removal. My literature search turned up protocols using anywhere from 10-15 iodine equivalents relative to the resin for 40-60 min. Given that apamin is already constrained by a single disulfide bond, I started with 15 equivalents of iodine for 60 min at room temperature, varying both reaction time and iodine equivalents, Table 1. Well, that’s interesting, Figure 3. I had hoped to find some conditions that didn’t fully convert the free sulfhydryls to cystine, but that doesn’t appear to be the case for this peptide and the conditions evaluated. 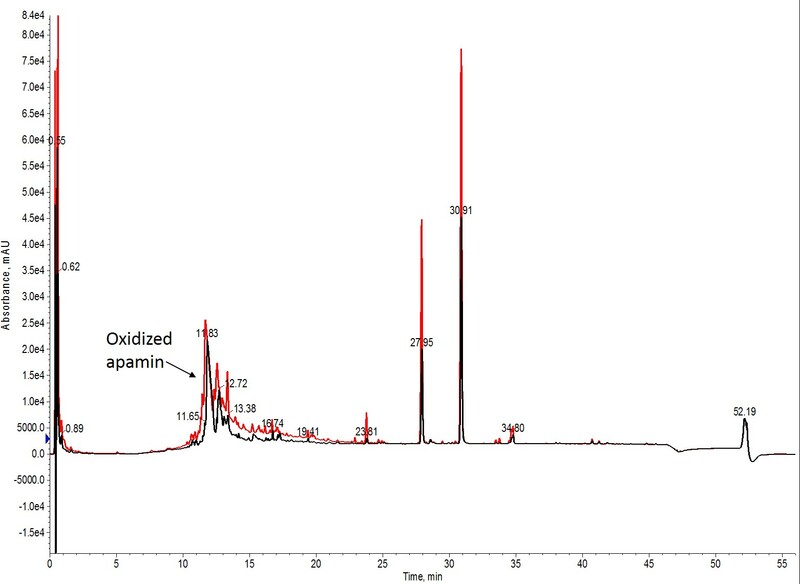 Figure 3: Overlay of the analytical HPLC chromatograms for the shortest oxidation time (black) and the fewest iodine equivalents (red). The crude profiles are superimposable, with only slight differences in peak amplitude caused by injection quantity. There is no evidence of residual reduced apamin by mass spectrometry (data not shown). While it certainly wasn’t an exhaustive condition profile, I still think there is something to learn here. For the case of apamin, a preformed disulfide bond between residues 1 and 11 likely induces a conformation positioning the remaining two cysteine residues in close proximity to each other increasing the local concentration and therefore reaction kinetics of the disulfide bond formation, Figure 4. Interestingly, in my hands, it doesn’t seem to matter which disulfide bond is formed first (data not shown). This is certainly not the case for all disulfide rich peptides. Figure 4: Two-dimensional representation of fully-oxidized apamin. I’ll definitely be working on some different conditions for on-resin disulfide synthesis, so stay tuned for additional conditions applied to more peptides. How do you remove Acm protecting groups? Next Next post: Disulfide rich peptides – in which order should the disulfide bonds be formed during on-resin oxidation?